I created this page last month, but it's one of my favorites. 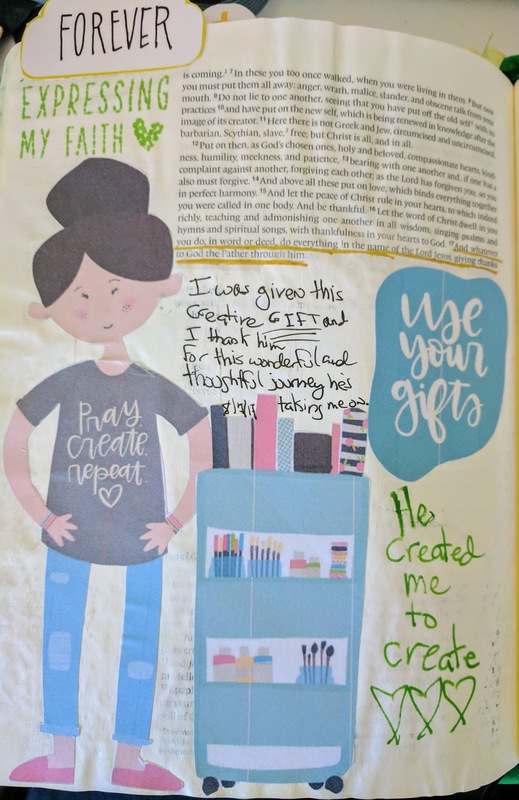 Illustrated Faith released Pray, Create, Repeat printable in their online shop and had a girl that looked like me. I knew I wanted to do something with it. Each printable set comes with a number of suggested verses. I used Colossians 3:17. This is the first time I used white paint and covered words on purpose. I wanted the space to put my girl and the Ikea cart along with journaling. I used 3 pieces from the set and the Doodles to Live By kit (sold out) from Dayspring. 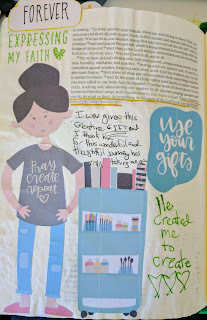 I started my Bible journaling journey about a year ago and can see how I've evolved with it. I used to be worried about covering up the words and just worked in the margins of my Bible. Slowly I started to drift into the word and now I'm not afraid to cover text and highlight what a verse or section means to me.